Home › Irons in the fire: News from our lab › Early life iron exposure: Is it a risk factor for neurodegeneration? Fair word of warning; this paper is very much what it says on the label – a perspective. But, with treatments for diseases like Alzheimer’s and Parkinson’s seemingly as far away as they were five or ten years ago, thinking outside the box might be what’s needed to help find solutions to problems that are plaguing our ever-ageing population. So, before getting to the pointy end of our argument, we need to go over three important pieces of evidence that support our theories. In 1924, a paper from Jean Lhermitte and co-workers first reported the appearance of abnormal deposits of iron in the midbrains of people with Parkinson’s disease. Since then, we’ve slowly discovered more and more about how iron metabolism doesn’t work quite right in a number of neurodegenerative diseases, like Alzheimer’s, and especially Parkinson’s. It’s a well-established fact that iron levels go up in our brains as we get older, but for some reason the rate of accumulation of iron is even higher in people with Parkinson’s. Combine that with the fact that at-risk cells in the Parkinson’s brain have trouble getting rid of excessive iron, and we have our first pointer that something isn’t quite right with how our brains handle this important but toxic metal when left to it’s own devices. Kids need iron for their growing brains. Iron is a key component of the enzymes that build nerve fibres, and without enough iron a child will show delays in neurodevelopment. To treat this issue, infant formula is generally supplemented with extra iron. However, the amount added is often up to 100 times the amount found in breast milk, under the assumption that it doesn’t get absorbed as well. A recent review of the literature suggested that this level of iron supplementation may be unnecessary, and even ineffective. Dr Arora and his colleague Dr Christine Austin in the new Senator Frank R. Lautenberg Environmental Health Sciences Laboratory at Mount Sinai, with Dominic and Philip published a Letter in Nature in 2013 that found barium distributions in teeth could be used to identify dietary transitions. Not only is this a great way at looking at what an infant was fed when they were young, we can also measure metals in the same regions and relate it to dietary intake! One other bonus – we don’t need people to save their baby teeth. 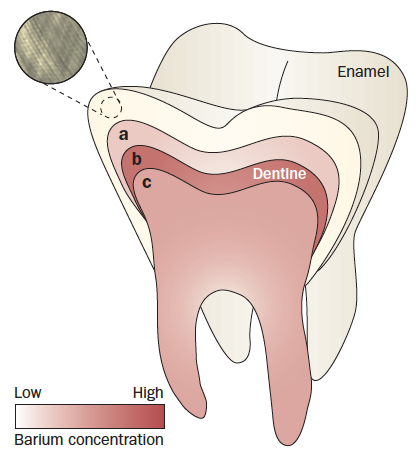 The first molar starts forming at birth, so we carry with us a permanent (provided we avoid dentures, of course!) record of our early life dietary history throughout our entire lives. Putting all this together, we’ve hypothesised that there’s a possible chance children fed iron-enriched formula might be loading their brains full of iron, after which it gets trapped and gives the normal accumulation with age an unwanted head start. In the graph to the left, we’ve tried to put this into perspective. During early life the brain is hungry for iron, more so than any other time in it’s life. Consequently, it’s grabbing as much as it can from the circulation and incorporating it into those enzymes that are using it to produce energy, provide oxygen and make new brain cells. Now, our brains are smart, but not that smart, and like a kid with a massive block of chocolate, sometimes it doesn’t know when to stop. That’s okay though, because for millions of years there wasn’t much iron to be had, and we, like pretty much every life form on Earth, evolved ways of holding onto that iron for later. Only problem is, what happens when the pockets our brain stuffs the iron into fill up? Iron, when let loose from it’s cage inside a storage protein called ferritin, is very reactive, something we’ve previously talked about with respect to dopamine, a chemical highly relevant to Parkinson’s disease. Does this mean everyone who was fed formula is going to get Parkinson’s disease? No. No no no no no!!!! Parkinson’s disease is a complex syndrome with a number of factors working against us, and high iron is only part of the story. A hot topic in disease research nowadays is the idea of “two-hit” hypotheses, where a combination of genetics and environment might work together at different life stages to do bad things. Lots and lots of people, including Ashley, Dominic and colleagues at the Florey have shown that iron metabolism in the brains of Parkinson’s patients isn’t quite right. This Perspective, and we stress, it’s just a hypothesis right now, calls for more research into whether too much iron during infancy might be a risk for neurodegeneration, even if it does help address iron deficiency. Like Goldilocks found out, and what we need to do, is find out what’s the right balance. Watch this space. This is the start of something new and big between us and our friends at Mount Sinai.